Figure 1: Stages in: (A) Winograd partial matricectomy procedure; (B) Zadik's total matricectomy procedure; (C) Frost's partial matricectomy. This article was published in Neale's Disorders of the Foot, Lorimer, French, O'Donnell, Burrow, Wall, Copyright Elsevier, (2006). 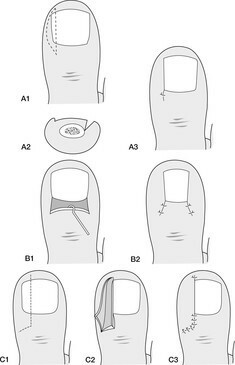 Partial matrixectomy was applied and the remnants were cauterized in compliance with the Winograd procedure after removal of the nail.